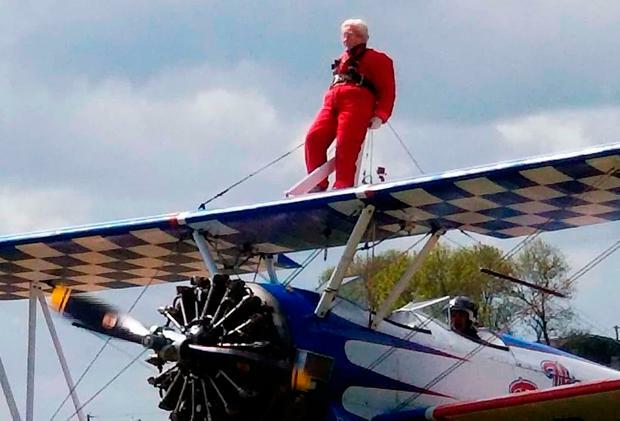 A daring 91-year-old is thought to have set a new record as the UK's oldest wing-walker. Norma Howard took to the skies above Cirencester, Gloucestershire, strapped to the top wing of a vintage biplane at 500 feet. The retired physiotherapist from Fleet, Hampshire, beat the record set last year by 88-year-old Betty Bromage. She took on the challenge to raise funds for Dementia UK, rather than for thrills or record-breaker status. Once back safely on the ground, she said: "I feel very relieved but also invigorated. "It was cold up there and I had so many layers on me I looked like the Michelin Man. The hardest bit was actually getting up onto the plane wrapped in so many clothes." Mrs Howard, who spends her time helping elderly friends to and from hospital, now plans to abseil Portsmouth's Spinaker Tower. "It's only 170 metres, that's pretty much how high I was today strapped to the wing of a plane," she said. At the age of around 80, Mrs Howard twice swam the equivalent of the England Channel in a swimming pool. Until recently, she used to ride on the back of her son's Harley Davidson motorbike. Eight years ago, aged 83, she sat on the handlebars of a 1925 Indian motorbike riding the Wall of Death. A spokeswoman for Dementia UK said: "We cannot thank Norma enough for her efforts. "All the money she is continuing to raise through pubic support will help Dementia UK's Admiral Nurses reach more people facing dementia."